Bring home the electric air blower from Skil, available at Autocon, and make all your cleaning tasks a breeze. This air blower has an ergonomic design and features that impress. It weighs merely 3.7 kilograms and can be used for hours. This variable speed electric air blower is equipped with a powerful 600 Watt motor which ensures maximum functionality. It has a no-load speed of 0 rpm to 16000 rpm. The high volume air output effectively blows out dust easily from the hard to reach areas like computer CPUs, behind tables, generators and other appliances in any home or an office. One can use this blower to dry of items after they are washed with water. Drilling into wood or concrete results in the production of dust particles. 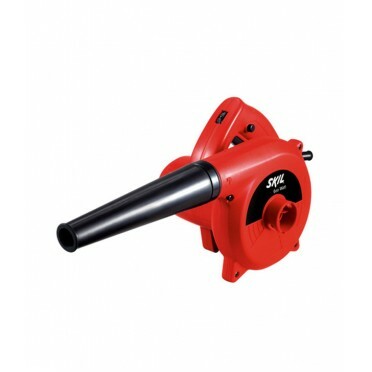 This powerful Skil blower can clean the holes you have drilled in no time at all. Air flows from the blower at a speed of 3.3 cubic metres per minute. It functions as a vacuum cleaner too. It can blow and extract dust and has its own dust bag too. It has a 3 metre long cable. Some other features are variable speed and a lock-on function. Skil Power Tools is a popular brand and an owned subsidiary of the Robert Bosch GmbH.